I’m sure that many Resident Evil devotees who are reading this enjoy the video games and live action movies alike, but I’m sure that we can all agree that the CGI animated films – Degeneration and Damnation – each brought something to the table that hadn’t been achieved in other endeavors. Whether it be bridging the events of certain games in the series or giving us the long overdue reunion between Leon Kennedy and Claire Redfield, Capcom and Sony Pictures have indeed spoiled us when it comes to fan service. On that note, the next entry in the series, Resident Evil: Vendetta, aims to honor that proud tradition, taking place between Resident Evil 6 and 7. As for the characters being utilized, that’s where it gets interesting. Leon has been the one constant in these animated offerings, and will once again have the chance to tag up with Chris Redfield, bringing together a dream team that RE 6 didn’t quite deliver. Not only that, but Rebecca Chambers makes her long overdue return to the franchise (we’re not counting anything Mercenaries related) and, from what we can observe, she hasn’t changed her clothing or hair style since the mansion incident in July of 1998. Now, it’s been known for some time that a one night only theatrical release will occur on June 19, but folks such as myself have been waiting with bated breath to learn of a home video release date. Well, wonder no more as we’ve recently gotten word that a Digital HD release will arrive on June 20, with Blu-ray, 4K Ultra HD and DVD releases set to follow on July 18. 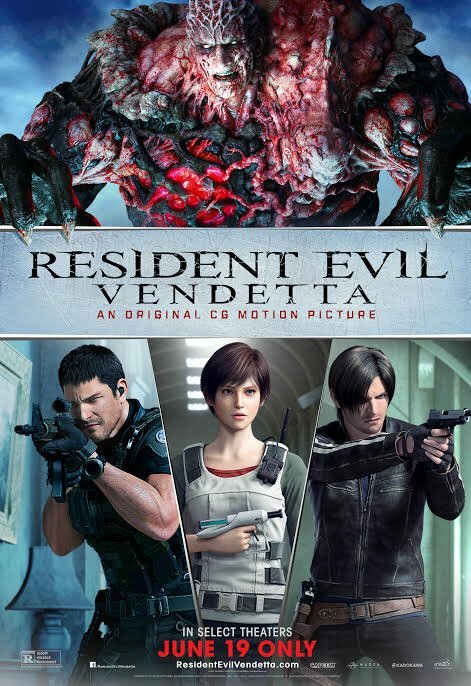 As of now, no box art for Resident Evil: Vendetta has been provided, but it stands to reason that the theatrical poster seen below will also serve that purpose as it’s being heavily circulated.